In “Freedom & Whisky,” Outlander finally departs from the structure of its season three episodes thus far. For the past four episodes, we’ve bounced between Jamie and Claire’s storylines. One (usually Jamie’s) has dragged more than the other, making it difficult to view each episode as a cohesive story. In “Freedom & Whisky” though, we stay in Claire’s storyline, which both raises the stakes for Claire and also places us in the same distant headspace as Jamie in time for the episode’s dramatic (and humorous) ending. The biggest drawback of “Freedom & Whisky” is Brianna. I’ve had my ups and downs with this character. There are times when Sophie Skelton evokes shades of Sam Heughan, connecting the two characters. But both actors have difficulty really standing on their own. Heughan plays off others—Caitriona Balfe in particular—excellently, but as this season has proved, it’s harder for him to carry storylines on his own. Skelton similarly has bouncy chemistry with Richard Rankin, but on her own, she sounds stilted, appears out of place. It doesn’t help that Brianna is such a poorly written character at this stage of the story. Brianna’s motivations make no sense. She’s more plot device than character. She’s far too eager to let Claire go, reassuring her mother that she’s all grown up and doesn’t need her anymore, pushing her to go back to Jamie. 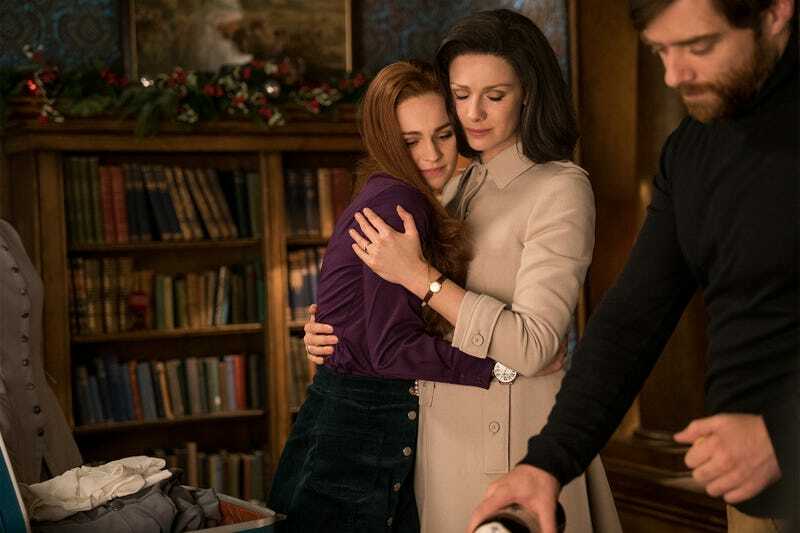 Brianna’s eagerness to let her mother go takes away from the emotional weight of Claire’s decision. Brianna is almost unflinching in the face of potentially never seeing her mother again, which makes it an easier decision for Claire to make, lowering the stakes of the situation. Brianna’s motivations are confusing. She’s a blank slate. There are a few fine scenes between Brianna and Claire in “Freedom & Whisky.” Brianna asks Claire if Frank hated her because she reminded him of Jamie and if Claire resents her since she’s the reason she left Jamie behind. Claire explains that Frank’s greatest joy was raising Brianna and that the second she held her as a baby in her arms, she did not regret coming back through the stones. It’s moving, but again, there’s just something hollow about Brianna. We barely even get to see her mourn Frank’s death, just a quick, quiet scene of her looking through old photos of him. Brianna’s lack of depth and dimension as a character, of course, makes it easier to swallow Claire’s decision to leave her behind in search of Jamie. Roger shows up in Boston with new information (which he waits until after dinner to divulge?! ), having discovered an article by Alexander Malcolm (Jamie’s middle names), published in Edinburgh in 1765. Claire, at first, rejects Roger’s information, says she could have lived the rest of her life without knowing. She wants to move on, and she has a daughter in this world. She can’t just up and travel to 18th Century Scotland again. Oh, but of course she can. Brianna’s on board! Brianna and Roger apparently want a Claire-Jamie reunion as badly as fans of this show. Look, Outlander has backed itself into a weird corner with this one. The show needs to reunite Jamie and Claire, because that’s the whole crux of the story. But Claire’s decision to leave also comes almost too easily, and the selfishness of her actions don’t seem to have any real weight or repercussions in the story. Brianna assures her that she’s an adult now, that she doesn’t need her anymore, which again just seems like an easy way for the writers to absolve Claire of any kind of guilt when it comes to this decision. Up until this point, I’ve enjoyed Claire’s friendship with Joe Abernathy. They share a relationship dynamic that we’ve never really seen from Claire before. Theirs is an easy, familiar friendship. They’re coworkers, but they’re also bound by their otherness in the medical field. Claire asking Joe if he finds her attractive cracks the foundation of that dynamic. It’s a strange and uncomfortable scene, particularly because we’ve never ever seen Claire be so insecure. Of course, there’s probably some anxiety that comes from the prospect of reuniting with a lover after 20 whole years. But the words just aren’t believable coming out of Claire’s mouth, and the scene sort of undermines the friendship between the two characters. The other significant Claire and Joe scene in the episode is strange in a different way entirely. Joe’s unpacking a box of bones sent to him by an anthropologist, and Claire walks in and immediately determines that they belong to a murdered woman. There’s something unsettling about the scene, but it’s also confusing. Are these bones connected to Claire somehow? That certainly seems to be the subtext. Outlander does have a tendency to foreshadow way ahead of time, planting little details that won’t be unearthed until many episodes—or in some cases, whole seasons—later, so it’s safe to assume these bones will return. Claire’s plan to go back through the stones with a pocketful of penicillin and some viable currency gifted to her by Roger and Brianna for Christmas is, frankly, ludicrous. Twenty years have passed since she last saw Jamie, and she has no idea if he has moved on, remarried, etc. But to Outlander’s credit, even though she’s embarking on a half-baked, hastily planned mission, I’m still rooting for Claire. Because if there’s one thing that remains consistent on this show, it’s the power of Claire and Jamie’s love. Twenty years be damned; this couple has made it through worse. Claire and Jamie still need each other, and Outlander needs Claire and Jamie—together in one time and place. The alternating timeline structure has become tedious, and while “Freedom & Whisky” is similarly a little wonky in its pacing, it’s one of the first episodes of the season to really excite. There’s suddenly hope, suddenly something for Claire to focus on other than missing Jamie and trying to maintain some semblance of normal with Frank. The montage of Claire crafting her own era-appropriate outfit for the journey is genuinely invigorating, and when Claire calls it her “batsuit,” it’s appropriate. She’s no superhero, but she is embarking on a high-stakes fantastical adventure. Still, for all the thrilling build-up of “Freedom & Whisky,” the episode overall is awkward and stiff, the grand character moments falling flat. Brianna isn’t the only stilted character here. What exactly is the point of the scene between Claire and Frank’s ex? She aggressively blames Claire for her inability to be with Frank, but Frank’s the one who said no to a divorce the first time around, and it was also his idea to raise Brianna as his own. Frank and Claire were both responsible for their misery. The whole encounter is forced and confusing. When Claire steps into Edinburgh in 1766, time slows. Claire has been waiting for this moment for twenty years, and we have been waiting for it for five episodes. Now that it’s finally here, she slows, she takes it all in. She lingers outside the publishing house, running her fingers over the sign that reads A. Malcolm. The anticipation is palpable, the tension thick. These final few minutes of the episode pull you completely in, enveloping you in Claire’s nervous excitement. She ascends the steps to the publish house, she moves slowly through it, a little uncertain. Then she hears Jamie’s voice, and she’s pulled to it, speechless for a moment, as if she isn’t sure if any of this is really happening. Finally, she speaks. We see Jamie only from behind, and the fact that we haven’t seen him all episode and know little about his life post-Helwater puts us in Claire’s perspective here. As Claire speaks, Jamie freezes. Even though we can’t see his face yet, his reaction looks like someone who has just heard a ghost. He turns, slowly. Their eyes meet for the first time in twenty years, and Jamie promptly faints. It’s a funny, abrupt way to punctuate the big reunion. And now that it has gotten to this point, Outlander is positioned to return to form. Claire’s voiceover has been used very sparingly this season, and that makes them much more effective. I really liked the puddle voiceover here. Maybe I watch too many cynical shows, but I was so worried that Claire wasn’t going to find Jamie right away. Claire dyes her hair before the journey and starts wearing her natural curls again. They have kind of given up on trying to make Caitriona Balfe and Sam Heughan look twenty years older, and you know what? I’m fine with that. Let the hot people keep being hot. Brianna’s struggle to assimilate back to her life in Boston is interesting and something that connects her to Claire, but we never delve deeper into it. Caitriona Balfe is such a force to be reckoned with.